Exclusive discount of 10% till end of March! 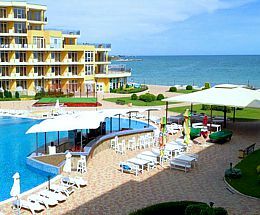 Are you looking for a nice place to spend your summer vacation in Bulgaria, well we would like to recommend to you few superb holiday complexes on the Bulgarian Black Sea Coast. - holiday apartments for rent suitable for 2/4 persons or 4/6 persons. All apartments are with great location, very close to the sea or first line from the beach, fully equipped and perfect for cheap, but cozy family holiday! 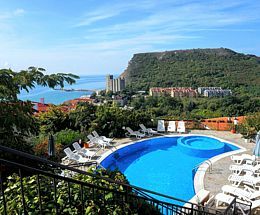 Villa for rent with pool and amazing sea view in Varna city! 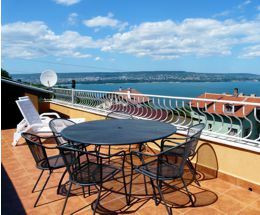 Holiday villa Panorama is located in Galata area, Varna city and offers private outdoor swimming pool, garden, sun-beds, BBQ; 4 bedrooms, 3 bathrooms, large living room with equipped kitchen, dinning area, sitting area; roof terrace with amaizing sea view; 3 to 7 kilometers from beaches. Wonderful self-catering holiday villa located only 3 km from the beach in Albena and Kranevo. The house is over two floors and consist of three bedrooms, two bathrooms, equipped kitchen and dinning area, living room with Cable TV and internet. Private pool, lovely garden and BBQ area. Holiday villa for rent in Balgarevo village, only 3 km from the beach of Bolata and 10 km from Kavarna beach; the villa is offering three bedrooms, three bathrooms, large living room with fully equipped kitchen and dinning area, private swimming pool and garden; cable TV and wifi internet. Self-catering holiday villa for rent near Albena, situated only 10 minutes drive from Balchik beach. The villa offers three bedrooms, two bathrooms, living room with fully equipped kitchen and dinning area. Private swimming pool, sun-beds and umbrella, BBQ, fenced garden, parking area in the yard. Holiday in Aheloy - complex is located first line on the coast. 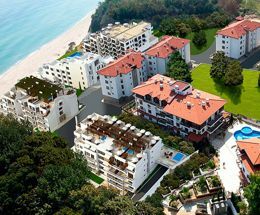 On the teritory of the complex there are two swimming pools with children section and water slide; sun-beds and umbrellas around the pool; pool bar for parents with wonderful sea view; small children playground; restaurant; shop; free of charge parking; cable TV and WiFi internet. 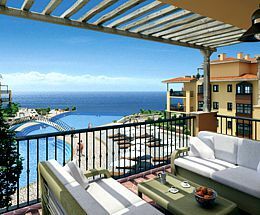 Holiday apartments for rent in Byala - complexes Byala Vista, Byala Cliff, Byala Center and Byala South. Flats are first and second line from the beach; available there are swimming pools, children playground, parking; 100 meters from the main pedestrian street, where all shops and restaurants are located. 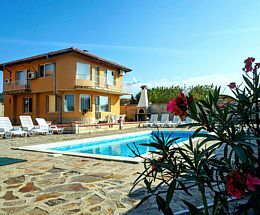 Perfect place for summer family holidays! Luxury holiday apartments in Kaliakria Beach Resort. Flats with 2 or 3 bedrooms, bathrooms, spacious living rooms, dining area with kitchen, large balcony with sea view. Outdoor pools, spa, gym, restaurants and cafes, a private beach. Wonderful sea view from the apartment!